Whimsical graphics and ageless appeal make diamond kites among the best in the sky. 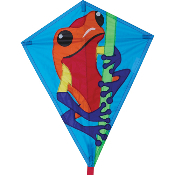 A traditional favorite for all ages, our 25" diamonds are framed with durable fiberglass and are very easy to fly. These make excellent gifts as well as home decorations.